If you’ve never been to the Catskill Mountains in upstate NY, it’s definitely worth a trip. The scenery is gorgeous, the air is fresh, and the water flows crystal clear. Doug and I were fortunate to have been able to squeeze in a few days in Windham, NY, a popular winter ski attraction, to spend time with our daughter Mandy, her boyfriend, Ron, and Lucy, the beagle. 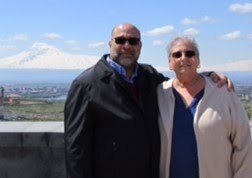 The weather was gorgeous – sunny, warm, with just a hint of cool in the air. Windham is full of surprises … for a small American town, it boasts a Greek diner, a Greek grocery store/luncheonette, and another Greek/Italian eatery all within a stone’s throw of one another. Mandy took us to the local Greek-owned store to pick up a few treats for our stay. 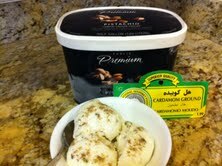 Among our purchases were tasty sesame cookies and a container of Kulfi Pistachio Cardamom ice cream. Man-oh- man was that ice cream terrific! Never mind a hot, spicy meal, just give me a bowl of that to-die-for ice cream! The Adirondack Creamery brand can only be found in certain stores in a limited area of the northeast, sorry to say. When we got back to Florida, I had an uncontrollable craving for this stuff. 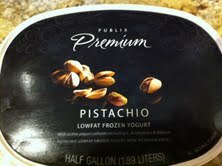 Fortunately, I discovered a suitable substitute at our local Publix supermarket - pistachio frozen yogurt studded with pistachio pieces. After sprinkling a little ground cardamom on it, I closed my eyes, took a taste, and pretended I was eating the real McCoy. (It was pretty good, actually.) Another plus - the Publix frozen yogurt has much less fat and fewer calories than the Adirondack brand, and that’s a good thing! For an extra special touch, pour a little rose water on top. What a wonderful sounding ice cream flavor, I will have to try to recreate that sometime. I love the Catskills, we used to spend many weekends there when I was growing up.